Voyager Beach Club is a Tampa Bay area resort, located oceanfront/gulf front in the quiet friendly community of Treasure Island. The brilliant white sandy beach fronting the resort is known as one of the widest and most enjoyable in Pinellas County. Recently refurbished, the resort’s condos will appeal to the Ancient Mariner in everyone. Each villa has been designed and furnished to be reminiscent of the unmistakable style of an Old World ship cabin. Treasure Island, in its own right, is a worthy port of call. A quaint town located just north of St. Petersburg Beach, Treasure Island’s personality is one emphasizing fine dining, specialty shops, and off the beaten path venues, all with a “world away” feeling from the busy streets of Tampa and St Pete. 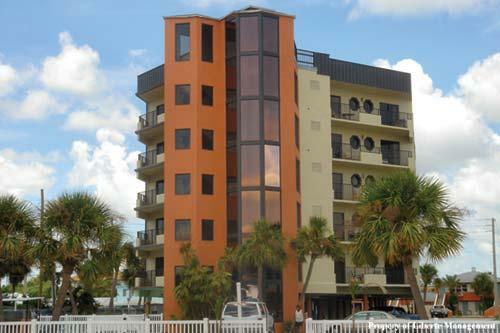 The Voyager is within walking distance of the famous John’s Pass Village, sports rentals and dinner or gambling cruises. Hop on the trolley and visit museums, shops, and family attractions in downtown St. Petersburg. Or, it’s just a quick drive over to Tampa for their famous cigars, major sport events, and Busch Gardens. Disney World and many world class entertainment and theme park attractions abound in central Florida, a day trip away. This one bedroom “A” unit condo vacation rental is located close to the western (water) end of the resort, away from the road. The villa measures about 600 square feet, and provides one queen bed in the bedroom and a queen sofabed in the living room. This lodging accommodation features a full kitchen (except, convection oven only), one bathroom, and a balcony with a peek view of the ocean/Gulf of Mexico.